Here, HCl is acting as the acid (proton donor) and H2O as the base (proton acceptor) as the reaction goes from left to right. Such reactions are very rapid and reversible, although, as here, the reaction may go very far to the right. It may be noted that if this reaction were reversed, H3O+ would be the acid, and Cl— the base. HCl — Cl— and H3O+—H2O make two sets of acid-base pairs (conjugates). Here, H2O acts as the acid, and this illustrates the amphoteric character of water: that is, its ability to act either as acid or base, depending on the substance with which it is reacting. It is inherent in the Bransted approach that the term "acid'' or "base'' has meaning only with respect to a reaction like (9-9). An analogous expression could be set up for a base, with the constant usually called Kb. In place of Ka and Kb, we often find pKa or pKb, where pK = — log K.
The larger the value of the equilibrium constant Ka, the stronger the acid. A so-called strong acid is one that is completely dissociated (equilibrium far to the right) and, in fact, all the available protons exist as H3O+. All acids above a certain strength appear equally strong in water, since the acid actually present is solely H3O+ in those cases. Strong acids may not be equally strong in other solvents. Similar comments hold for bases, with OH— being the strongest base in water. Bransted acids fall into three major classes: binary acids, oxo acids, and hydrated metal ions. Binary acids contain hydrogen and one other element. One naturally occurring example is HCl, which is emitted in large amounts by volcanic activity. HCl also may be formed on incineration of chlorine-containing organic substances. Most of the HCl from these sources is dissolved in rainwater and washed out of the atmosphere in a short time (see Chapter 5 in connection with ozone destruction). A second example is H2S, which also has volcanic origins and is a decomposition product of organic material such as proteins under oxygen-poor conditions. Strengths of binary acids increase with increasing bond polarity and with decreasing bond strength. Oxo acids are those in which the ionizable hydrogens exist as OH groups attached to a not-too-electropositive third element. Environmental examples include H2CO3 (formed from CO2 in water), H2SO4 (a result of sulfur oxide emissions, important in acid rain and in influencing climate through effects of sulfate aerosols), and H3PO4 (originating from phosphates in detergents and fertilizers). These particular examples are polyprotic acids. Strengths of oxo acids increase with the number of nonhydroxo oxygen atoms attached to the third element. More than one proton may be lost. 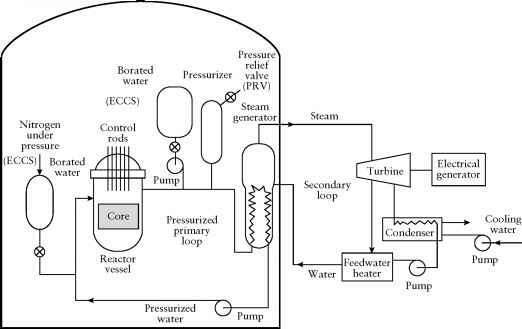 Processes of this sort, which are important in the behavior of metal salts in water and in the hydrolysis of these salts to form insoluble products, are further treated in Chapter 10. All Bronsted bases have unshared pairs of electrons that can be donated to the 1s orbital of a proton. This picture of acid-base behavior leads to the Lewis definition of acids and bases. A base is an electron pair donor; an acid is an electron pair acceptor. In the limit that Ka << [H3O+](pH << pK), [HA] = Ct and log [HA] = log CT; that is, log[HA] is independent of pH. 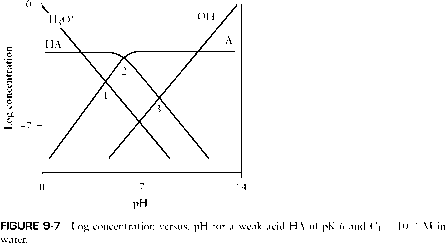 Thus, a plot of log[HA] versus pH has zero slope as long as the pH is small. In this same region, log [A—] = log Ct + log Ka + pH. The slope d(log [A—])/d(pH) = 1. If pH >> pKa, similar arguments give the slopes of the plots of log [A—] versus pH and log[HA] versus pH as 0 and — 1, respectively. When pH = pKa, [HA] = [A—]. We can use these approximations to show the concentration of the species present as a function of pH graphically. Figure 9-7 is such a plot for a hypothetical monobasic acid of pKa = 6 at Ct = 10—3 M. Point 1 corresponds to a solution of HA in water, point 3 to a solution of a salt (e.g., NaA), and point 2 to equal concentrations of HA and A—. The scale of the ordinate will depend on the value of CT. The pH (labeled H30+) and pOH (labeled OH—) lines in Figure 9-7 are plotted from pH + pOH = 14. For a solution of only HA in water, the electroneutrality requirement gives [H30+] = [A—] + [0H—], and pH thus is easily evaluated. In fact, since [0H—] is so small, [H30+] = [A—] here. A solution of the salt NaA of the same total concentration would be partially hydrolyzed to form HA and 0H— in equal concentrations. The pH is given where these lines cross. Electroneutrality requires [Na+] + [H30+] = [A—] + [0H—]. FIGURE 9-8 Titration curve for a weak acid of pKa about 6. Broken lines indicate the effect of excess strong acid (on the left) or excess strong base (on the right). defined as the number of equivalents per liter of strong acid or base required to change the pH by 1 unit.) The pH changes rapidly in regions of equivalent or neutralization points such as 1 and 3.